These chicken skewers are great for a busy week night, and end up with a light and sweet glaze that is just lovely. The recipe is so easy to do. Just slightly precook the chicken on a grill, make the glaze and finish in the oven and serve with the remaining glaze. What could be easier than that? Be sure to soak your skewers for about 1/2 hour in water so that they do not burn on the grill or in the oven. 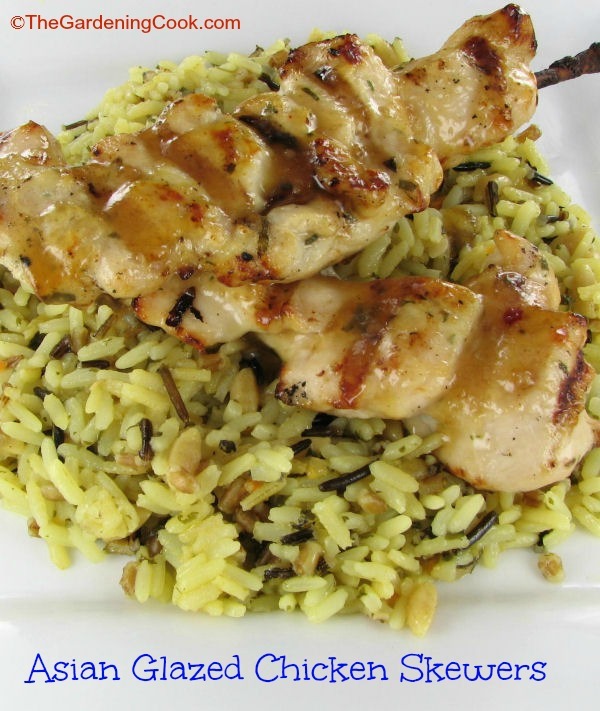 I served this recipe with my Wild rice and Pine Nuts side dish and it was a great combo. Place the chicken chunks on bamboo skewers that have been soaked in water. Season with salt and pepper. Heat the olive oil on an outside grill or stove top grill pan. Add the chicken skewers and cook until not quite done but with grill marks on the outside (they will finish in the oven with the glaze, so need to be just under done. Whisk together the honey, soy sauce, toasted sesame oil, chili garlic sauce, garlic, and salt in a bowl until smooth. 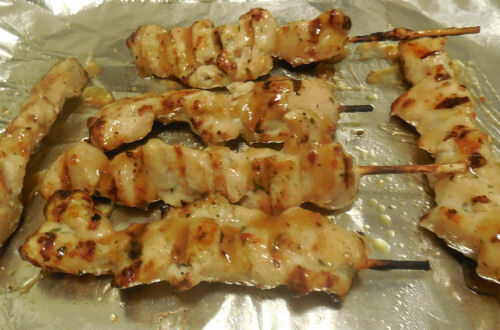 Place the chicken skewers on a baking tray lined with foil and sprayed with Pam cooking spray. Cook for four minutes and remove and baste with about some of the glaze (save some for serving later). Return to the oven for another four minutes. Remove and serve with the dipping glaze.